I've been meaning to update but I lack the motivation. Excuse my laziness! I wore this last Friday to look at venues (for the wedding) and then later to my dinner date with Jean. Always a good time when we meet up. I look forward to our next date! Hope you had a great long weekend Khatu! I love EVERYTHING about this look! You look fab darling! Yay for bright colours! In love with that blazer - I saw it at Zara before (not sure if it's the same one) and wanted to get it so bad. Had to rethink though because I have a light pink blazer from BCBG. You look amazing, as usual. I love your wedges and of course that chunky turquoise necklace. So cute. Love your entire look! I saw that blazer in an electric blue and now kicking myself that I left without it. Love this outfit! It is so chic! 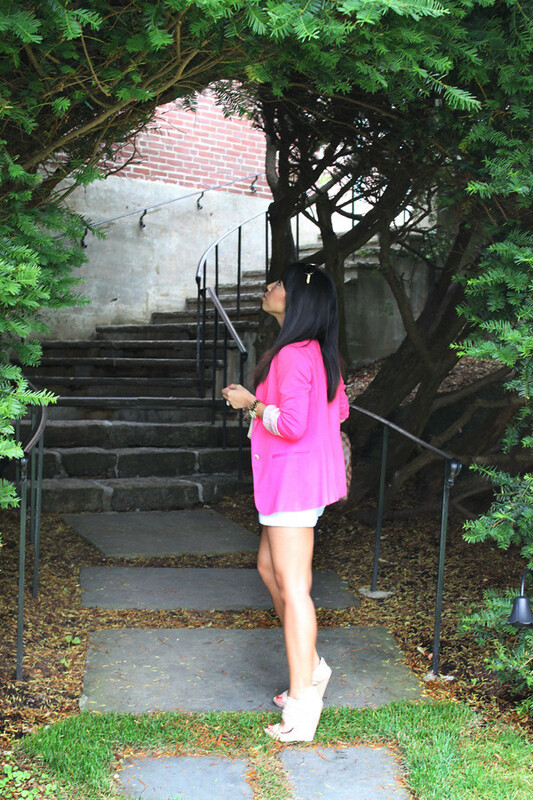 I LOVE that combination colors of fushia in your blazer and turquoise in your necklace! Such a gorgeous look! I love the pop of pink with the statement necklace. The color combo in your outfit is FAB! I love nudes paired with bight pastels. This is gorgeous as usual. Can't wait to see the venue that you guys chose! I bet it was sooo exciting! I want your closet. End of story. What venues did you visit? I can't wait to hear more about your vision. So beautiful! I absolutely love your style! That blazer is incredible! Just so you know, I featured one of your looks from a little while ago in my latest blog post. If you get the chance, stop by and check it out! That is SUCH an amazing blazer. I love it! Such perfection! And holy cow how do you walk in those wedges! Love how the colours work together! Just found your blog after loving your outfit on jean's blog! I love the blazer and white shorts, so pretty!! Also, this venue looks super familiar! Is it at misslewood by any chance? God save Zara! =) You look stunning.